Reduce hourly wages by 0.4 percent. Increase hourly wages by 0.7 percent. The federal individual income tax code permits taxpayers who itemize to claim a deduction for their local real estate (property) taxes. However, the deduction is controversial. Two criticisms are that it is mostly claimed by upper-income taxpayers, and that it softens people's opposition to high taxes and wasteful spending by local governments, because some of those taxes can be written off at the federal level. Two defenses of the deduction are that it better measures people's incomes, recognizing that some of their income has been transferred to others, and that the bulk of the local property taxes fund the public schools, increasing human capital, the cost of which could arguably be deductible, as with other capital formation. Nevertheless, the purpose of this case study is not to discuss the merits or demerits of the deduction but is simply to examine the growth effects if the deduction were repealed. 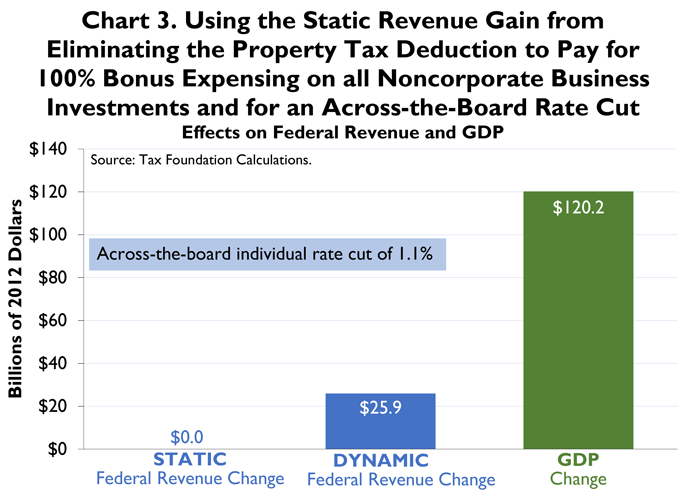 In a conventional static revenue estimate that holds the size of the economy fixed, the Tax Foundation's simulation model estimates that abolishing the federal income tax deduction for local real estate taxes would have raised federal revenue by $34 billion in 2012. (See Chart 1.) The Treasury estimate for 2012 is $29 billion, and the Joint Committee on Taxation revenue estimate is $25 billion. If the revenue gain were used to finance an across-the-board federal income tax rate cut of 3.1 percent of the marginal tax rates, the decline in GDP would be only about half as large at about $42 billion. Federal tax collections would decrease by a net $10 billion. From a growth perspective, this is not an attractive trade. Capital (even owner-occupied housing) is quite sensitive to taxes, more so than the supply of labor. 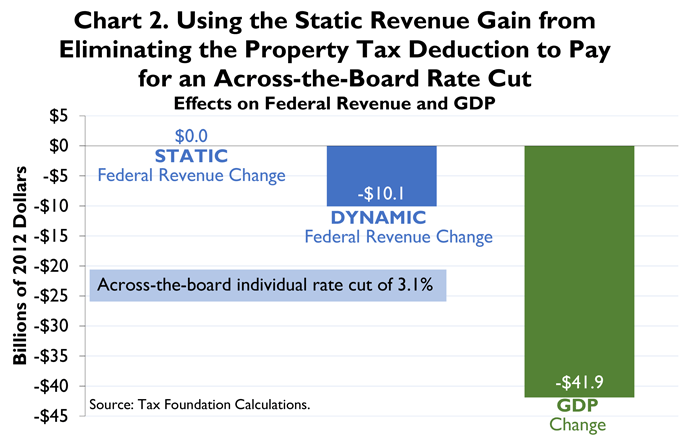 Raising a property tax can do more economic harm than may be offset by a dollar-for-dollar tax rate cut falling on wages, interest, and non-corporate business income. The trade would have to be justified on redistribution grounds. 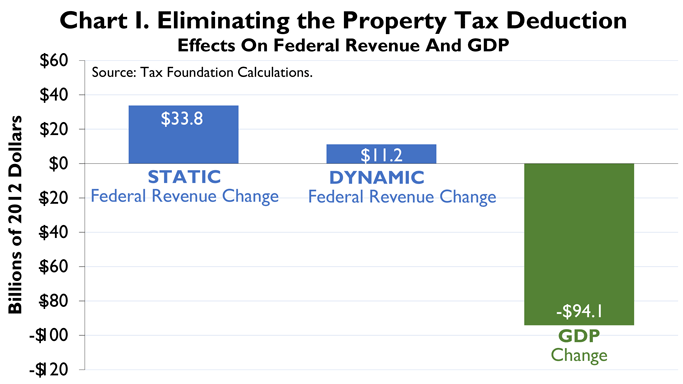 In contrast, we also ran a dynamic simulation in which the residential property tax increase would be countered by a business property tax decrease. Most of the static revenue gain was used to increase the cost recovery of all non-corporate investments in equipment, software, non-residential structures, and residential (rental) structures. These were given 100 percent bonus expensing. This left a residual static revenue gain of $11 billion. The residual $11 billion was then used to fund a 1.1 percent reduction in income tax rates. Under this scenario, the GDP gain would increase to $120 billion, and the net federal revenue gain would be $26 billion. (See Chart 3.) This approach, adding expensing, would yield more GDP than a tax rate reduction alone. Finally, we determined the impact of these scenarios on employment and wages. We found that simply eliminating the property tax deduction would reduce employment by the equivalent of about 216,000 full-time workers and cut hourly wages by 0.4 percent. With the rate cut offset, employment would increase by the equivalent of about 72,000 full-time employees, but wages would still be cut by 0.3 percent. With expensing of investment and a smaller rate cut, employment would be increased by the equivalent of about 119,000 full-time workers and hourly wages would rise by about 0.7 percent. In evaluating the revenue and marginal tax rate effects, we used the SOI sample of tax returns for 2008 that are the basis for our model and grossed the results up to 2012 values. 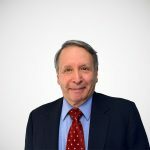 In evaluating the impact on the housing stock, we took the lower JCT estimate of the tax increase for a more conservative estimate, assuming that the JCT may have a more recent estimate of the size of the current housing stock following the decline in construction after the bursting of the housing bubble. For example, the 25 percent tax rate would fall to 24.2 percent. 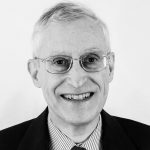 We assume proportional cuts in all of the ordinary income tax bracket rates but no cuts in the lower tax rates on capital gains and qualified dividends.